A new rendering of Bronx Point, a mixed-use development planned for the South Bronx waterfront, has been unveiled, providing a closer look at L+M Development Partner and Type A Projects’ plan to bring over 1,000 units of housing, a food hall and the country’s first brick-and-mortar museum designated to Hip-Hop to the neighborhood. As YIMBY reported, the housing will be delivered in two phases, with the first bringing 600 units of permanent affordable public housing by 2022. The second phase is expected to wrap up about three years after the first. Designed by S9 Architecture, the complex will include a new waterfront esplanade, state-of-the-art multiplex theater, flashy outdoor performance area and educational spaces. 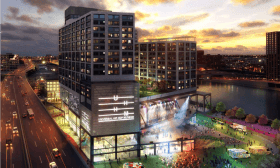 A vacant waterfront site in the booming South Bronx will give way to an enormous affordable housing complex with 1,045 residential units, a home for the much-hyped Universal Hip-Hop Museum, a waterfront esplanade and outdoor performance space, a multiplex theater, and, of course, a food hall, in this case curated by Anna Castellani of Brooklyn’s wildly popular Dekalb Market Hall. 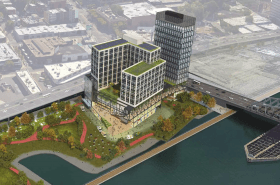 The Real Deal reports that L+M Development Partners won the bid for the $200 million project, dubbed Bronx Point, which is located adjacent to Mill Pond Park and the 145th Street Bridge that runs into Manhattan.